The chess tournament was a blast. It was a big chess party fest. I should have taken pictures of the lobby area where there were chess paraphernalia and food strewn all over the place. 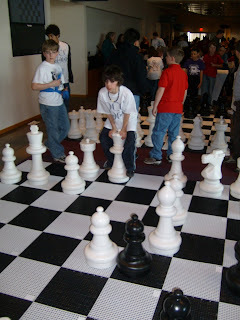 This was a chess tournament for school age kids who were from all over Ohio and Kentucky. My son played 5 games in the 4th grade section and finished with a score of 3 wins and 2 losses. He was a half point away from winning a trophy. After each game my wife and I would watch Nate as he walked down the hall and we would try to read his expressions and guess whether he won or lost a game. With some kids it was obvious whether they won or lost but with Nate he had a cool calm look about him and we couldn't tell if he won or lost until he came up to us and say, "I won", or "I lost". He'd then go horse around with other kids playing the big floor chess set or at a table with the Indian kids. He commented that, those little Indian kids are fast and good. I was impressed with his attitude of good sportsmanship and having fun. 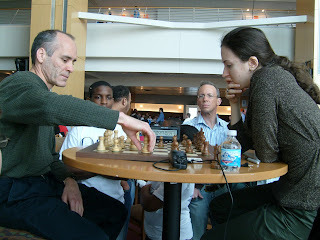 PapaLouie versus International Master Irina Krush! While the kids played, the parents were entertained by Master chess players commenting on the top rated games being projected on monitors in the lobby area. Some masters would play 5 minute games with kids or parents. Here I took the challenge to play International Master Irina Krush. I knew I wouldn't even come close to possible pulling off a win but I asked her if she would comment on the game so that I could learn something. After my 5 minute melee she went through the whole game move by move to point out the various alternative moves that I could have done. I was impress she remembered every move and was able to offer suggestions. She did this for anyone who wanted to play a game with her. No wonder she is America's top rated female chess master. Wow, well that sounds like fun! Good for your son for being a good sport, that will take him a long way. Sounds like a wonderful experience. I like your comment about challenging her to a race, Brian. How a competition combining running and chess? You could run on a track or loop and make a move each time you pass the board. Sounds like a nerdy blast!! I love that first photo!! and my son, from age 8 to his early 20's never lost to me,...ever... and he used to trash me good. Soccer champs & Chess weekend.